I’m finally posting a recipe for making chocoflan or “magical” or “impossible” cake, as some people like to call it. And why “impossible”? 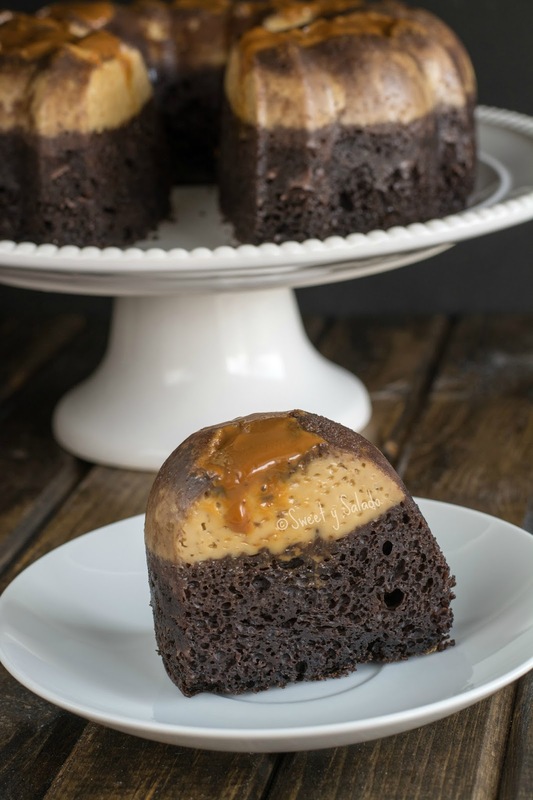 Simply because you place the cake batter on the bottom of the pan and the flan batter right on top of it, but once you take it out of the oven and flip it over the “impossible” happens… the chocolate cake ends up at the bottom and the flan stays on top. Whaaaa? It’s just a matter of science since the flan mixture eventually ends up weighing more than the cake batter, it then sinks to the bottom of the pan while the cake batter floats to the top during baking and that’s how they switch places. But the best part is that this is probably one of the easiest recipes you will ever make and everybody goes crazy for it, especially if you use arequipe or dulce de leche at the bottom. And to make it even easier do what I do and use your favorite cake mix to make it, that way you’re guaranteed a perfect cake. Although you can also use any of the chocolate cake recipes that I already have on the blog. Also, if you pay attention you will notice that the flan is the exact same recipe I used for the homemade flan recipe which is amaaazing. ¼ cup (about 3-4 tbsp) dulce de leche or caramel. Use more for serving. Grease a 12-12.5 cup (about 2.8 liters) Bundt pan with either cooking oil or softened butter. Place the dulce de leche or caramel in the bottom of the pan. Set aside. Prepare the cake mix according to the instructions of the package. My box indicated to mix all the ingredients in a large bowl. 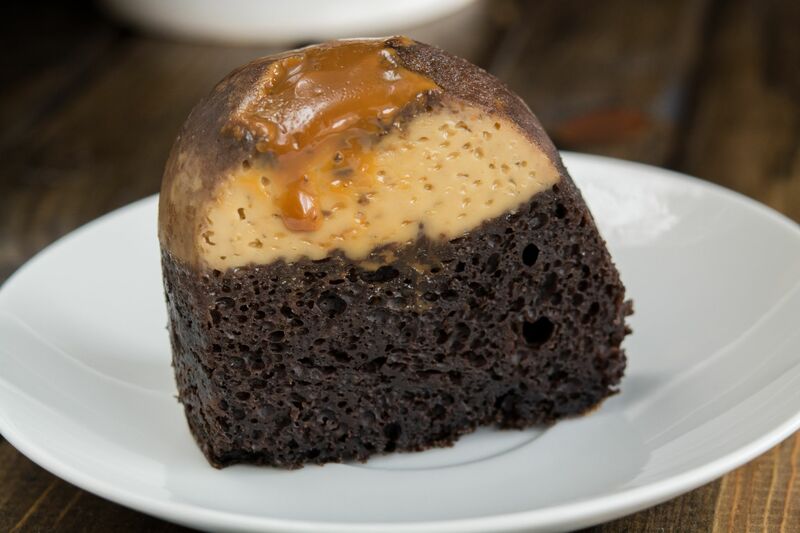 Pour the cake batter over the dulce de leche or caramel that was placed in the Bundt pan. In a blender, blend all the ingredients for the flan until smooth. Slowly pour the flan mixture over the cake batter. Cover the Bundt pan with aluminum foil and place it inside a large roasting pan. Then, pour in the hot water into the roasting pan until it comes halfway up the sides of the Bundt pan. Bake for 1 hour, then remove the aluminum foil and cook for another 15-30 minutes or until a toothpick inserted in the middle of the cake comes out clean. 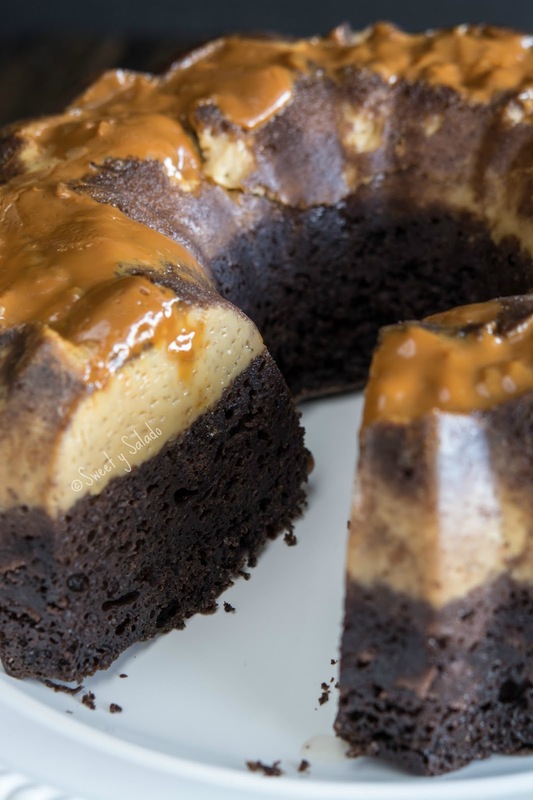 Remove the Bundt pan from the oven and let the chocoflan cool completely on a wire rack. Once it's cool place a serving plate over the cake and flip it over. 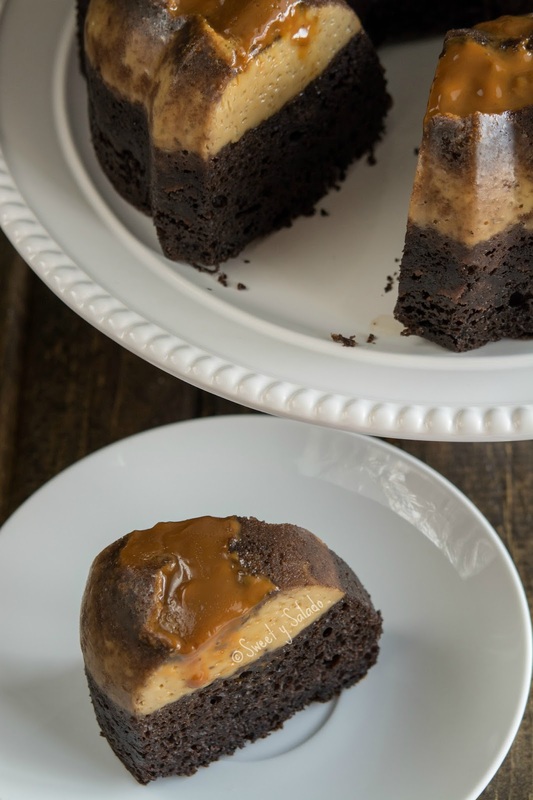 Serve with extra dulce de leche or caramel.